Upon relinquishing the Presidency of the United States in August 1974 (thus becoming the first holder of the US Presidency to resign the office) Richard Nixon remarked in his emotionally powerful farewell speech to White House staff: «Only when you have been in the darkest valley, can you know how magnificent it is to stand on the tallest mountain». Nixon’s atonement infuses the growing electoral momentum and fundamental political essence of Mrs Hillary Clinton’s second campaign to become the first woman President of America. In many ways Mrs Clinton’s political story and career invokes the title of Conrad Black’s biography of President Nixon: «The Invincible Quest». 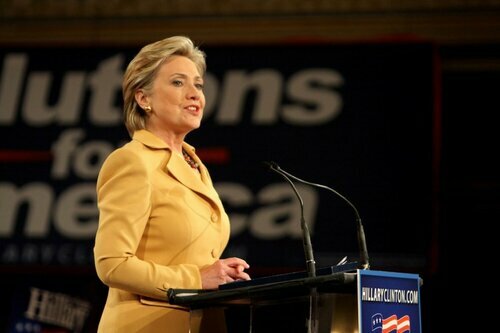 As the Democratic and Republican Party’s world famous Iowa Caucus is soon to officially kick off the 2016 US Presidential nominating season – with caucusing commencing on February 1st – for Mrs Clinton Iowa represents an opportunity to wipe away the January 2008 stain of humiliation and disappointment she suffered in her first White House bid. Eight years ago it was Iowa which dealt Mrs Clinton’s Presidential ambitions a shocking third place finish. This was a blow of deep magnitude, ultimately acting as the catalyst for the insurrection of the Obama campaign to impede an outright Clinton restoration, thus ushering in a generational power transfer in the leadership of the Democratic Party, which had been the Clinton Party since Al Gore lost the Electoral College count in 2000. Whether or not one politically agrees with Hillary Clinton or admires her personally, one quality which both friend and foe can agree on is Mrs Clinton is a born survivor and fighter with a strength and resilience that is rare in many Western democratic politicians in the early 21st century. One of Mrs Clinton’s favorite mottos is «If life hands you some lemons, you make some lemonade». This is precisely the organizing principle through which she has conducted her political career for the last two decades, indeed most of her life. The 1998 Lewinsky scandal is a prime example. What was an extremely painful, difficult and undignified public humiliation of the former First Lady was turned into a master stroke in political repositioning and a public relations rebirth. Through harnessing the outpouring of public sympathy and embracing the role of the stoically dutiful betrayed wife, Mrs Clinton was able to change public perceptions of herself, which had been highly polarized from the moment she debuted on the national American stage as the assertive, academic feminist with her famous quip about being a stay at home Mom «baking cookies and having teas» and launch her own political career out from the shadows of her husband in the Empire state of all places. By becoming the first First Lady in American history to stand for and win elected public office (as well as the first woman to win state wide office in New York) Mrs Clinton set herself on a historic mission to become the first woman President of the United States, taking the legacy of her heroine Eleanor Roosevelt to a new level. The original political calculation and planning in Hillaryland had been to spend eight years in the US Senate and return to the White House triumphantly at the end of the Bush Presidency of 2001-09. As the slogan went in 2008, «it takes a Clinton to clean up after a Bush». Yet a little known Senator from Illinois upset that particular apple cart. However, razor edge defeat in the 2008 Democratic Presidential Primary didn't stop Mrs Clinton in her tracks. Just as when disaster and disappointment had befallen Hillary before – such as failing her Washington DC Bar exam; the near collapse of her marriage and joint political partnership with Bill Clinton circa 1987-89; the failure of her healthcare reform package in 1994 or the tawdry spectacle of the Lewinsky imbroglio – Mrs Clinton licked her wounds, picked herself up, dusted herself down and went right back out to do battle in the Political Arena for another round. Now at the start of 2016 Hillary Rodham Clinton, 68, is on the verge (once again) of breaking the highest and hardest glass ceiling in American political life and with it becoming the most powerful woman in the history of the world. How has the former Secretary of State come back from the political abyss of June 2008? The answer is at once – with all great talented geniuses – simple and complex. Whether it has been dealing with an abusive, authoritarian father; a philandering husband; a vicious and hostile media; a public polarized and conflicted on the issue of female leadership; a crazed Republican Party or internal opposition from the anti-Clinton wing of the Democratic Party – Mrs Clinton has demonstrated a rare human capacity to survive, thrive and flourish in the face of intense aggression designed to beat her back and keep her down from a variety of quarters. Hillary has turned stumbling blocks into stepping stones and has never been afraid to assert herself in an overwhelmingly male dominated political world and with it challenge and shatter conventional thinking and stereotypical paradigms on gender. Whether it was as a bright, creative, ambitious student coming from a small town, mid-western, unconnected middle class background; an Ivy League educated intellectual and lawyer-civic activist political spouse in socially conservative Arkansas at the forefront of education reform; the first First Lady to have entered the White House as a professional working woman in her own right with a post-graduate degree, remit to work closely alongside her husband President on healthcare policy, march in a Gay Pride Parade or as a Senator, Presidential candidate and America’s Chief Diplomat – she has operated in extremely stressful, high-pressure environments at the epicenter of issues regarding gender, sexuality, ethnicity, class, religion opportunity – surrounded by opponents who viewed her very being and presence as a powerful rebuke and threat to the traditional patriarchal social and economic order. From Whitewater to healthcare reform; Lewinsky to the 2008 Primary defeat; Benghazi to email servers – Mrs Clinton’s enemies have thrown nothing less than the kitchen sink at her over the last twenty to thirty years and each time she has emerged the stronger and more determined for it, exuding grace under fire and always maintaining a steely dignity and composure. As former British Prime Minister Margaret Thatcher remarked in 1993: «My life was a daily battle, and I never gave up». Indeed, it is that fighting spirit, resilience and courage which has carried Mrs Clinton back to the historic inflection point of following in Mrs Thatcher’s footsteps to lead her country. When Mrs Clinton had to endure the climax of the extreme 1990s partisan attempts by the Republican Party to destroy her husband's Presidency and drive them from the White House in disgrace, her long time friend Sarah Erhman called her to check on how she was coping. «Well,» Hillary told Erhman «I feel like just staying in bed and pulling the covers over my head, but you know, I have to keep going». For Erhman that exemplified precisely the core of Mrs Clinton's character: «It's a strength but also a kind of defiance that nothing, nothing and no one is going to shake her belief in what her life is about». So, if it is to be President Hillary Clinton sworn in on January 20th 2017, one thing is clear which foreign leaders can expect from a second Clinton in the Oval Office. 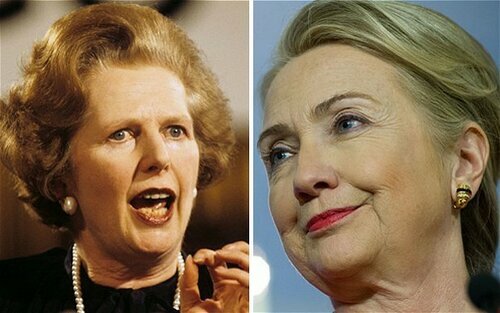 A President Hillary Clinton will be no walk over and will be one tough cookie to deal with bringing back to the White House an iron will, courage, stamina and perseverance redolent of Britain's Iron Lady Margaret Thatcher.